A new genetic road map of tobacco has been used to successfully identify and clone two mutated genes associated with how efficiently the plants used nitrogen - a discovery that could one day help reduce the need for nitrogen-based fertilisers in growing crops. These same genes could also play a role in helping to reduce the levels of some carcinogenic compounds in cigarette smoke. The overuse of nitrogen-based fertilisers on crops can lead to an excess of nitrate in the environment, which can in turn lead to water acidification and eutrophication, in addition to nutrients leaching from the soil. This can cause reductions in biodiversity and crop productivity, as well as having negative impacts on both animal and human health. In the case of tobacco, inefficient metabolism of nitrogen by the plant can lead to high concentrations of some nitrogen-based compounds in the leaf, the presence of which lead to the formation of certain tobacco-specific toxicants in smoke. 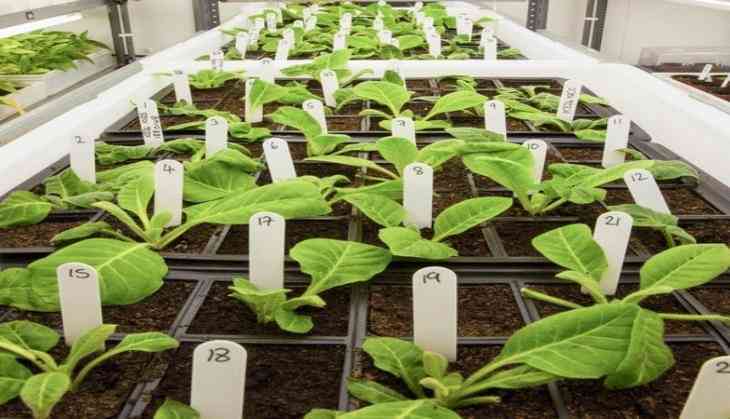 Scientists at British American Tobacco, North Carolina State University (Raleigh, North Carolina, USA) and the Boyce Thompson Institute (Cornell University, Ithaca, New York, USA) worked together to develop a new genetic roadmap of the tobacco genome (Nicotiana tabacum). This road map lays out the position of (or "anchors") 64% of the tobacco genome, compared to just 20% in previous attempts. The tobacco genome is about 50% larger than a human genome (at about 4Gb). It is also significantly more complicated than the human genome because it is allopolyploid, that is, it arises from the hybridization of different ancestral species (in this case N. sylvestris and N. tomentosiformis) -- each tobacco cell contains sets of chromosomes originating from both of these species. This makes assembly of the genome sequence technically very difficult because the combined genomes are very similar in sequence -- in effect a bit like trying to put together two jumbled jigsaw puzzles containing very similar, but non-identical, pictures. The sequence also containsa lot of repetition, making assembling some areas like trying to complete a jigsaw puzzle of blue sky. The new assembly has already been used to successfully identify two mutated genes that explain why Burley tobacco is not very effective at utilizing nitrogen compared with other types of tobacco. "Different cultivars of Burley tobacco all share these two gene mutations, giving us a handle on why they differ from other tobaccos," explained Allen Griffiths, Head of Plant Biotechnology, British American Tobacco. "We believe this represents the first successful map-based gene discovery for N. tabacum, and demonstrates the value of a high-quality genome assembly for future research." The impact of Burley's lower nitrogen use efficiency on its metabolism and growth means that some plant variants contain increased levels of nicotine, other alkaloids, and nitrites, resulting in higher levels of tobacco-specific nitrosamine (TSNA) compounds in their leaf. Modifying the mutant genes could potentially also lead to the development of novel tobacco cultivars that contain lower levels of TSNAs. To anchor the genetic code, the researchers used a new technique known as optical mapping. This involves taking a fingerprint of the genome -- marking specific sequence patterns in very long sequences of unknown DNA -- to create a barcode of DNA fragments. The barcode is then used as a template onto which the new assembly can be dropped and matched, a bit like completing a jigsaw on top of a trace of its picture. This has enabled much more of the genome to be anchored to tobacco chromosomes compared to previous assemblies. The study appears in BMC Genomics.